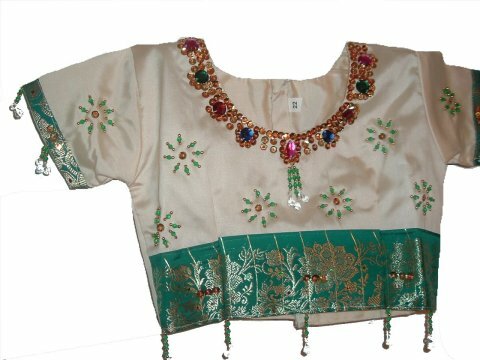 Beautiful cream and green silk ready-to-wear Indian sari for kids. The readymade sari set consists of a blouse, petticoat and sari. The sari is pre-pleated and is attached to the petticoat. 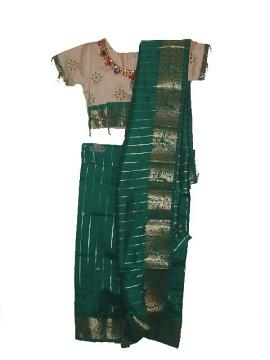 The entire base of the saree is green with gold stripes and gold border. Quick & easy to wear sari - just slip it on like a skirt, and then arrange the "pallu" the way you want to; a sari in minutes!! The short blouse is cream with bead bootis all over and a gold border at the sleeves and at the base. The blouse is short - it leaves the midriff exposed. The skirt part of the sari has a drawstring waistband. Sizes available for children aged 1 year and up. This item in Indian Sarees for Girls category was first added to our catalog on 07-03-2010. Buy Quick & Easy To Wear Cream & Green Ready-made Saree For Children, sold & shipped by desiVastra.com where you can shop online for Traditional Dress for Baby Boy & Girl, Indian ethnic Wear for Kids. This Kids Saree collection has been tagged as Silk Saree, Kids Wear, Fancy Saree Wrap.